If you enjoy reading eBooks, there are many services available that allow you to read multiple ebooks. Two of the best services that I’ve found are Kindle Unlimited and Scribd. Each service has different pros and cons, so I wanted to discuss them both in this post. Please note, Kindle Unlimited is something completely different from the Kindle Owners’ Lending Library, which is an Amazon Prime membership benefit. Kindle Unlimited is a service that allows you to read unlimited ebooks – however, you can only choose from books that authors have made available through Kindle Unlimited. Most of these books are published by authors who have published on the Kindle platform (like me), so there aren’t too many best sellers or classics available through Kindle Unlimited. If you want to read the latest Stephen King novel, on Amazon, you’ll either have to buy the eBook and download it to your Kindle or buy the physical (hardback or paperback) version. as “Netflix for Books” because many of the books that I want to read aren’t available through the Kindle Owners’ Lending Library, and I didn’t want to get a Kindle Unlimited membership for 9.99. Scribd is only 8.99, and so far I’ve read four of Rhonda Byrne’s books, “The Secret,” “The Power,” “The Magic,” and “Hero”. I also read “The 5-Second Rule” by Mel Robbins, and I’m currently reading “Different Seasons” by Stephen King and “365 Excuse Me: Daily Inspirations that Empower and Inspire” by Mina Parker. I would not have been able to read any of these books through Kindle Unlimited, or through the Kindle Owners’ Lending Library. Another Scribd feature that I like, is that in addition to eBooks, Scribd also provides newspapers and magazines, and musicians can find sheet music for many different instruments on Scribd. One thing that’s important to note, however, is that you cannot read unlimited books on Scribd – you can only read up to 3 ebooks a month, and listen to one audiobook. If you don’t use all your credits, they do roll over to the next month. Readers can accumulate up to 9 ebook credits and 3 audiobook credits. UPDATE: Scribd is now unlimited! No more credits – you can read as many books as you want or listen to as many audiobooks as you want for no additional cost! I hope this post has provided some valuable information on both Kindle Unlimited and Scribd. I personally like Scribd because I can read a lot of books on Scribd that I can’t read on Kindle Unlimited. When deciding which service is going to be best for you, consider how many books you can get through per month, what titles you want to read, and whether you also want to be able to read other types of media, such as newspapers or magazines. 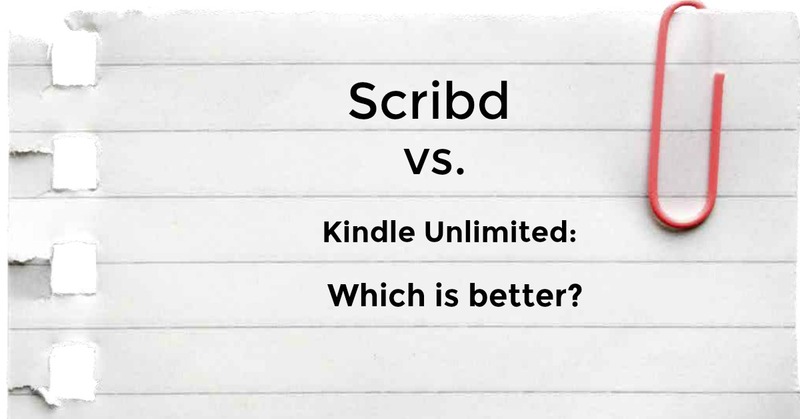 If you’ve had any experience with either Kindle Unlimited or Scribd, please feel free to comment below. You may want to updated this…Scribd is now unlimited…no more credits. Thank you sis much for the tips.